Do you think this technique would work with other devices? I have a RAID card that after flashing computer wont POST if its installed. This tutorial must be starred everywhere. Thank you for sharing it! This was a complete lifesaver! I bricked my onboard Marvell 9123 SATA controller by mistakenly flashing it with the wrong firmware. 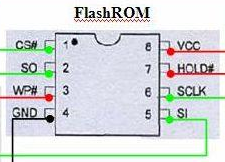 The firmware for the controller is contained within the motherboard BIOS. I just shorted the two pins on the EEPROM chip (exactly as shown in your picture) while I booted up the computer, and then after a reboot, the BIOS recognized and automatically re-flashed the firmware for the Marvell controller. It’s now running 100% perfect!!! Maybe I was just lucky, but I tried everything I could possibly find to re-flash, and this was the ONLY thing that worked. My motherboard is an ASUS Rampage III Formula. For others who own this mobo and had the same thing happen to them, the EEPROM is located a little above the Marvell Controller chip which sits just behind the SATA ports on the mobo. Mine is an MX25L4006E EEPROM chip. Hopefully this will help others!!!! Thanks again netkas for the heads up!